I recently (h/t: Nacin) came across this tutorial by Nenuno Creative that recommends bypassing WordPress core implementation of Gravatars in order to output custom Gravatars. Below, I present a brief tutorial for a much better way to implement custom Gravatars in a way that doesn't require bypassing WordPress' core functionality. I would recommend using this in the “comments.php” page, somewhere around “< ? php wp_list_comments(); ? >” or whatever similar you may have in your theme! Not a terribly helpful implementation suggestion, is it? 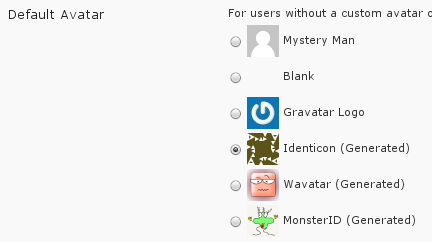 (And in truth, since wp_list_comments() outputs a Gravatar by default, it's actually a rather incorrect recommendation.) Fortunately, all of the above can be implemented in a much, much easier way. First, wp_list_comments() by default outputs a 32x32px Gravatar based on the Comment Author email address. So, all we need to deal with are custom Gravatar size, and custom default Gravatar image. 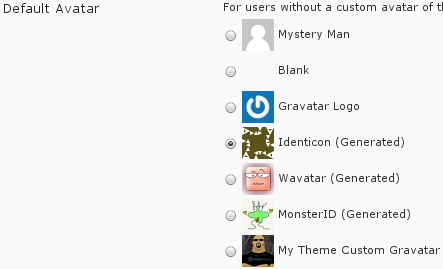 We will be hooking into this list, using the avatar_defaults filter, in order to add a custom image to this list (h/t: WPEngineer). You will need to replace /images/avatar.gif with an appropriate image file, that you have uploaded to your Theme directory. Simply select your custom image, and save settings. Voila! We've just implemented everything from the Nenuno Creative tutorial, in a way that uses, rather than bypasses, core WordPress functionality.